I have a confession to make. Neither Rick or I have met Beryl Ann Byrd in person, but we’ve been aware of her amazing cake designs and her company Just Fabulous Pastries in San Diego for a number of years and have always highly respected her work. We feel like we know her because we’re fellow designers in the same social and trade networks, have exchanged emails and we’ve seen her on the Food Network Challenges. Like Rick, Beryl has both an art and pastry background, and takes a lot of risks with her cakes, -- we can definitely appreciate that! 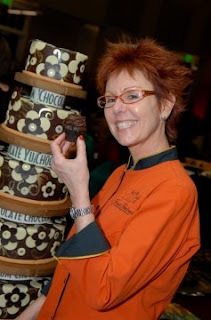 As one of the premier cake designers in the country, Beryl receives an impressive amount of media attention. She has appeared 4 times in the past 3 years on the Food Network, first on Warren Brown’s show Sugar Rush followed by 3 cake challenges. She was a judge on The Elvis Birthday Cake Challenge and a competitor on the other 2 challenges: Surprise Birthday Cake Challenge and the Surprise Wedding Cake Challenge. In addition to running Just Fabulous as a fulltime-and-a-half career, Beryl manages to write in her blog (also Fabulous), called The View from the Top of the Cake. Rick and I would like to thank Beryl for being so open and thorough with her responses. The interview was, in one word, Fabulous! Sasha Reichart: I was reading that your culinary career began in Oklahoma City in the early 80’s preparing desserts at a restaurant. What brought you to Oklahoma City from your hometown of San Diego? Beryl Ann Byrd: I know. What on earth would possess anyone to move from San Diego to Oklahoma, right? Actually, it’s a pretty cosmopolitan place and during the early ‘80’s it was kind of a boom town. I had a friend who, with 2 other women, was opening a cute little cooking shop in Edmond, not far from OKC. They sold all the usual cooking gadgets but their idea was to offer ready to go food such as soups, breads, and desserts and I got to prepare lots of those items. I also worked in a very “happening” restaurant called the Roosevelt Grill doing their soups, pates, and breads and SOME desserts although that territory was fiercely protected by their pastry chef. Everybody was young and fun and we had a ball. From there I went to another little restaurant in OKC and actually got to do all their desserts, which I prepared in my apartment and delivered each day! I knew NOTHING about professional dessert making so everything was a recipe out of Bon Appetit or Gourmet magazine. It was a time of great experimentation for me. 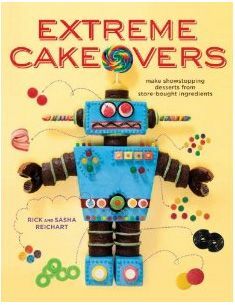 Sasha Reichart: At what age did you know you wanted to pursue pastry as a career? Beryl Ann Byrd: I considered a cooking career while I was in high school but, seriously, thought I would get fat so I dropped that idea. I know. I was weird. It wasn’t until my father’s birthday party sometime in the late ‘70s, when I decided to do an all dessert menu, that I realized that might be my calling. I still use the same cheesecake recipe that I made for that party. SR: Were you classically trained in culinary school or did you learn on the job? BB: Culinary school was never an option for me. I learned everything I know from working in a fabulous restaurant in Chicago (which no longer exists) under chefs who had worked with Chef Jean Banchet at Le Francaise in Wheeling. Back then, that was considered one of the top restaurants in the country. Anyway, it was there that I learned that you didn’t need a different recipe for every single cake, and that something basic like crème anglaise could have a hundred different applications just by changing a couple of ingredients, and by having cakes and buttercreams and premade garnishes, seemingly difficult composed cakes could be made in a flash. It was one of the most stressful and educational times of my life. SR: Your cakes are so artfully designed. Were you an artist prior to making pastries? What are your favorite mediums to work with? BB: I’ve always been artistically inclined. I sold beaded necklaces in high school. Loved watercolor and pen and ink. For a lot of years, I worked in a form of jewelry called cloisonné. A painstakingly precise process involving many layers of fired enamel inside cells created by super fine strips of gold or silver which resulted in stunningly brilliant pieces of jewelry depicting objects or scenes. (Is that a run-on sentence or what?) This is NOTHING like the mass produced pieces you see for $5.00 from China. SR: I'm familiar with cloisonné and the jewelry is exquisite. Let's talk about the beginning of Just Fabulous Pastries which opened in 1987, over 20 years ago. That’s very impressive! How have things progressed in terms of staffing and your menu since the opening? BB: We’ve been through so many different “phases”. In the beginning, it was me and ……me. Baker and dishwasher. 2 accounts. Gradually, I picked up more accounts, hotels, restaurants, caterers. Moved my business many times, each time to a larger location but still always in a shared situation with a caterer. Certainly not ideal. Nothing like the delicious aromas of a bus tub of freshly chopped onions or a rolling rack full of steaming meat to permeate the delicate surface of a lemon tart or buttercreamed wedding cake. Our staff has grown to accommodate the growth in business. At one time we had a regular staff of about 12. During the holidays, it could go up to 15 or 16. We are now back down to a staff of 5 due to a change in the direction of our business focus. We no longer do wholesale. It’s all about the cake! SR: What are your most popular desserts? BB: We had a restaurant a while back and our clientele became addicted to different items. Our flourless Chocolate Decadence will always be a winner. The Chocolate Passion Dome is amazing. A light chocolate mousse with a center of passionfruit, mango and banana cream, glazed with chocolate and surrounded by chards of gold flecked chocolate. We still keep these items in stock for occasional restaurant or customer orders. SR: Oh my goodness, that Chocolate Passion Dome sounds incredible! We are impressed by the plethora of offerings at Just Fabulous Pastries –- wedding cakes, birthday cakes, shower cakes, sculpted cakes, mini cakes, cookies, petit fours, cupcakes, retail … am I leaving anything out? BB: Hmmm. I think that about covers it. 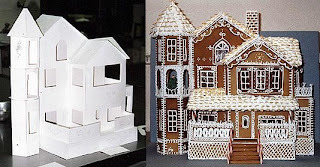 Oh, we’ve made some unbelievable gingerbread houses. One holiday, Tiffany’s had us do 5 different Victorian style houses for their windows. They gave me the photos and I had to basically become an architect. I made each piece out of thin cardboard first and completely built each house out of those pieces to be sure it all worked. Then, using those patterns as templates, we cut each piece out of gingerbread and baked them. And then assembled and decorated them. It was totally insane. Especially for what we got paid. 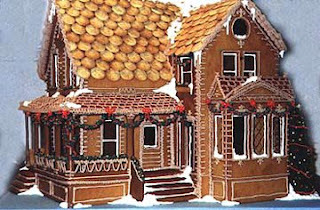 I rarely do gingerbread houses anymore because they are truly a labor of love. You can NEVER be paid for the amount of time that goes into them. SR: We couldn't agree with you more about the gingerbread houses. Rick has also made them in the past when he worked for other people and they are a painstaking process. We don't offer them either. What are some signature offerings of Just Fabulous Pastries? BB: We’ve gotten a reputation for our Material Girl cakes. 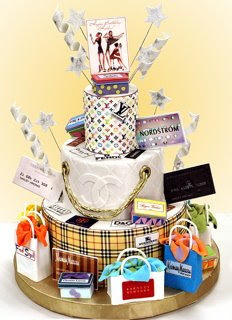 Those are tiered cakes which usually feature a different designer pattern on each level and then we just pile on all the “stuff” that particular client loves. Maybe shoe boxes, shopping bags, magazines, sunglasses, clothing designers names, jewels. Anything goes on these cakes. SR: Those are some FUN cakes! Let’s talk about your experience with the Food Network competitions. Did you have a preference being a judge or a competitor on the Food Network Challenges? BB: I have to say that, as nerve wracking as it is to be a contestant, I far prefer that to being a judge. BB: I did not like having to pick out something that was “wrong” with the cakes. No matter how diplomatic you try to be, nobody likes to be picked apart after working their butts off for 7 or 8 hours. People like Kerry Vincent, who have developed a reputation as the Evil Judge are probably better suited to that role! And you just expect to be skewered by her anyway! 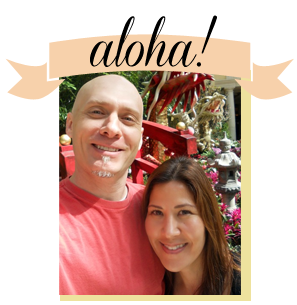 SR: When the Food Network contacted Rick last year to compete in a cake challenge he turned it down partly due to the difficulty of transporting products from Hawaii and we already had events booked on those dates. Have the preparations for the Cake Challenges been well, challenging for you as well, and how so? BB: The preparation for them is the worst part. Especially for the 2 Challenges that we did where we had no knowledge of what our cakes would be other than a vague theme. We didn’t have the luxury of weeks of planning a killer design and then carefully compiling a list of exactly how much cake, buttercream, or decorations that could be pre-made. We were told how many cakes of several sizes to bring (although they didn’t say how deep they were to be and we made 3 inch deep cakes while everybody else brought little shorties-we wasted TONS of cake!) and part of the judging was based on how much cake you actually used or wasted. I think the scariest part is that you’ll forget some major item so you REALLY have to be organized in your packing. We happened to have several huge ice chests which worked really well for the plane ride. Far safer than cardboard boxes. Check back tomorrow for part 2 of my interview with Beryl. 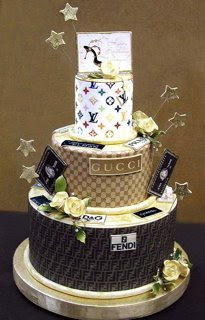 See a huge selection of cakes on the Just Fabulous Pastries website and blog.